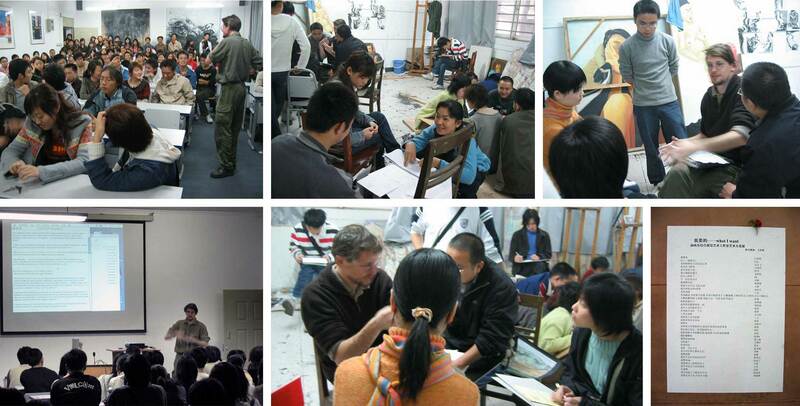 [Course description] This two-day workshop was designed to shake up the students of the oil painting department, which at the time had been very conventional, by challenging them to rethink their creation process and encourage their ability to speak about art. creation in contemporary art. And to their surprise, their over-night assignment was to formulate and sketch an art project based on the answer they had previously given. During the second day, students were organized into discussion groups, to evaluate the efficiency of their project before creating a concept board. [Course Results] This workshop concluded with a casual exhibition of the students' concept boards hung in the middle of a busy entrance hall.